Delivering only the best...Quality Signs. Competitve Prices. The manner in which a business presents itself to the public identifies it's location and product which is crucial to it's success. The first impression is key, and we provide you attractive, legible signs to do so. Fieseler signs has been catching the public eye since 1947. We are family owned and operated, and now are in our third generation. We continue to take pride in our workmanship and stand behind it. 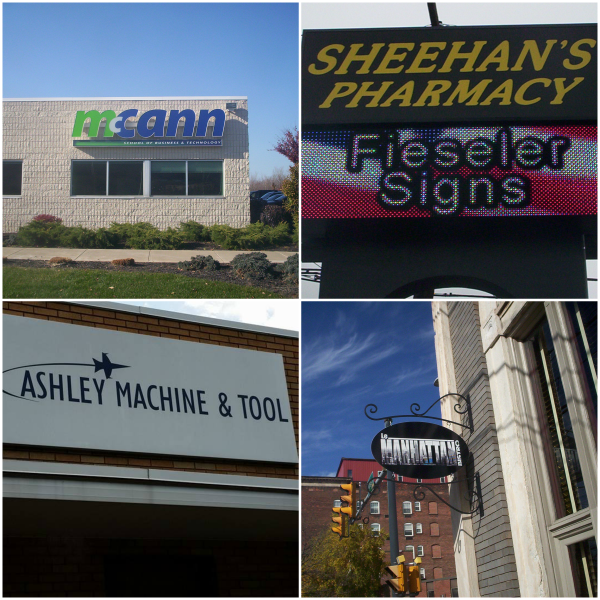 Businesses throughout the northeast attract attention to their business through signs fabricated, designed, installed, and maintained by our skilled and experienced technicians. Throughout years of business Fieseler Signs has maintained, installed, and fabricated a countless number of quality signs. In terms of cost effectiveness, signs provide remarkable value. When compared to different sources of advertising media, signs consistantly deliver more market coverage for a lower price. Signs are your best sales person since they work for you 24/7 and, if maintained properly, signs can keep working for years to come. We take pride in the people who keep us running! and our hard working full time staff! "When you've decided that Fieseler Signs is right for you, we will send a representative to your business site to evaluate your requirements, come up with a custom design to suit your needs, and also a proposal!"